Trail mix was invented (according to legend, in 1968 by Hadley Food Orchards) to be eaten while hiking or doing another strenuous activity. It’s lightweight, portable, and full of energy-dense ingredients like dried fruit, nuts, and chocolate—perfect for trailside noshing. 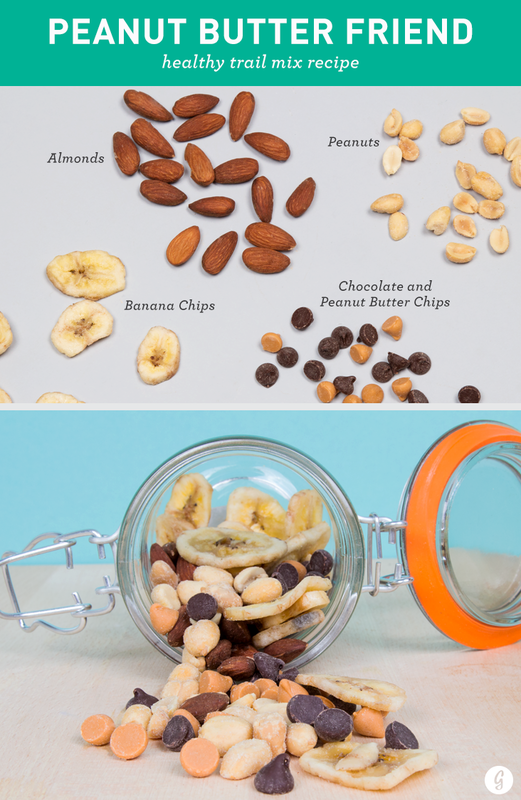 For those same reasons, trail mix can pack a hefty caloric punch, especially when we mindlessly munch while sitting around at work or home. Keep serving size to a quarter-cup or less to keep this yummy snack from sneaking into “dangerfood” territory. Our healthy favorites: Almonds, pistachios, cashews, peanuts, and walnuts. Higher-calorie macadamia nuts, hazelnuts, Brazil nuts, pecans, and pine nuts are also good options in moderation. This sugary treat can easily become a dangerfood, so pay attention to the ingredient list and serving sizes. In moderation, dried fruit can be a great source of fiber, antioxidants, calcium, and vitamins A, C, and K.
Look for dried fruit options with as little added sugar and preservatives as possible (some varieties, like cranberries, are naturally quite tart and almost always sweetened with cane sugar or apple juice). It’s also pretty easy to make your own dried fruit at home in the oven. Our Favorites: Dried apples, cherries, cranberries, goji berries, blueberries, strawberries, apricots, raisins, banana chips, figs, pineapple chunks, mango, and dates. 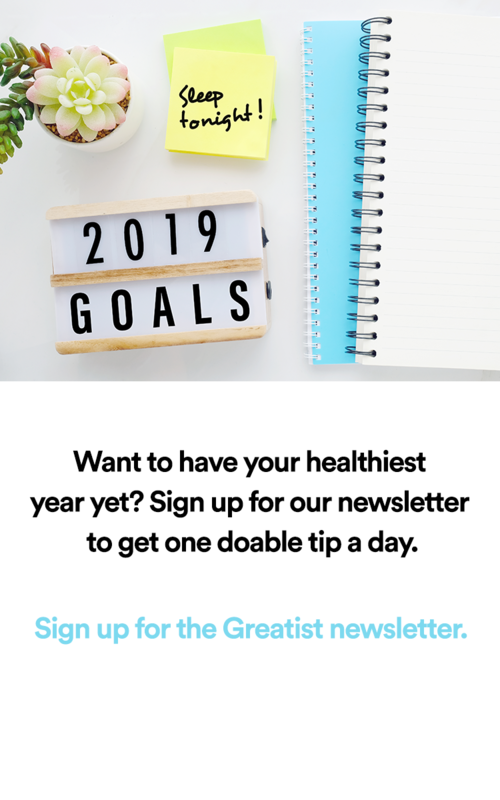 Add some complex carbohydrates to your custom blend for extra fiber, which boosts overall energy and helps to keep you full Whole grain rye breakfast — sustained satiety during three weeks of regular consumption. Isaksson H, Tillander I, Andersson R, Olsson J, Fredriksson H, Webb DL, Aman P. Department of Food Science, Swedish University of Agricultural Sciences, Uppsala, Sweden. Physiology & Behavior, 2012 Feb 1;105(3):877-84. .
Add a sprinkling of M&Ms, chips of various kinds (chocolate, peanut butter, carob, butterscotch), cacao nibs, yogurt-covered raisins, chocolate-covered coffee beans, mini marshmallows, or chocolate-covered nuts. When going the chocolate route, choose dark varieties for extra antioxidants. Once the building blocks are all set, adding spices is a great way to change up the flavor a bit. Season the mix with sea salt, curry, ground ginger, cinnamon, nutmeg, cardamom, or cayenne pepper. Or create your own mix of spices. Keep tastebuds guessing with wasabi peas, coconut flakes, sesame sticks, dried ginger, and coffee beans. 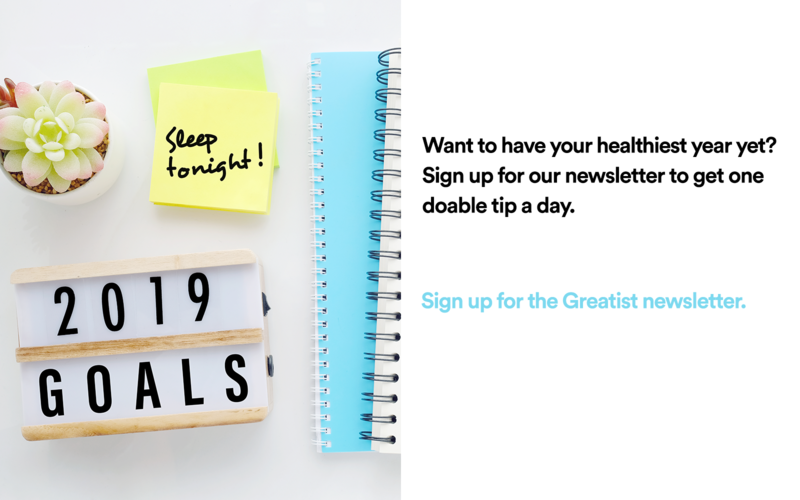 Everyone has their own nutritional and taste-related needs, so we listed these mix ideas without set ratios or measurements. 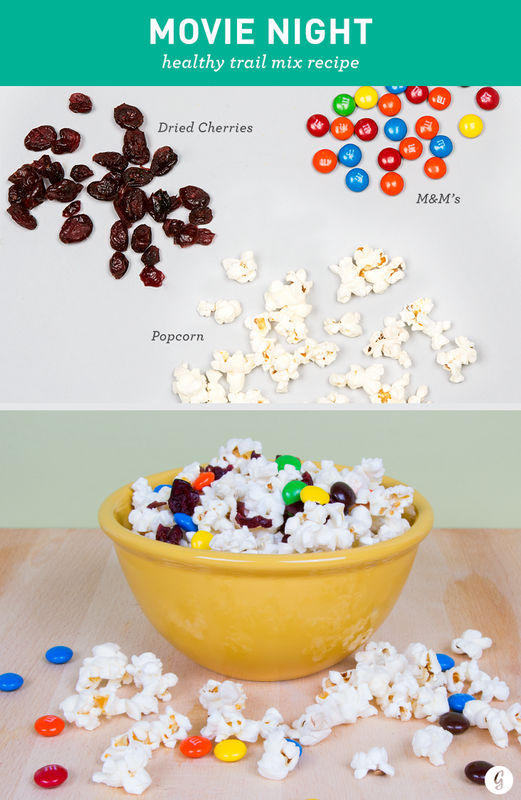 There are no rules for trail mix—combine whatever sounds good! 1. 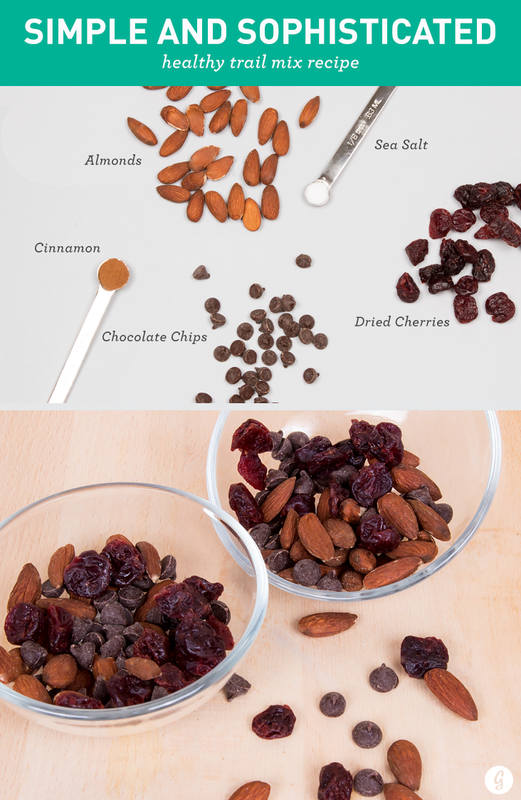 Simple and Sophisticated: Almonds, dried cherries, dark chocolate chips, sea salt, cinnamon. 2. Old-School GORP: Peanuts, raisins, M&Ms. 3. Tropical Mix: Cashews, Brazil nuts, dried mango, coconut flakes, banana chips. 4. Fall Flavors: Pecans, dried apples, maple granola, pumpkin seeds, nutmeg, cinnamon. 5. Savory Seeds: Almonds, pumpkin seeds, sunflower seeds, garlic powder, onion powder, cayenne pepper. 6. Power Mix: Goji berries, pistachios, dried blueberries, flax seeds, dark chocolate chips. 7. Rich and Creamy: Coconut flakes, white chocolate chips, hazelnuts, chocolate-covered coffee beans, cacao nibs. 8. Beachy: Macadamia nuts, white chocolate chips, dried pineapple, coconut flakes. 9. Nuts for Nuts: Almonds, walnuts, peanuts, cashews, pecans, raisins. 10. Exotic: Peanuts, raisins, puffed rice, pretzels, curry powder, chili powder. 11. Spicy and Savory: Almonds, wasabi peas, sesame seeds, dried ginger, Chex cereal. 12. Raw Energy: Walnuts, pumpkin seeds, sunflower seeds, cinnamon, nutmeg, sea salt, dried apricots, dried cranberries. 13. Peanut Butter Friend: Banana chips, peanut butter chips, peanuts, almonds, dark chocolate chips. 14. Coffee Shop: Hazelnuts, almonds, raisins, chocolate-covered coffee beans, white chocolate chips. 15. Chocolate Lover: Hazelnuts, dried cranberries, chocolate-covered almonds, M&Ms, cacao nibs. 16. Monkey Munch: Banana chips, peanuts, sea salt, almonds, dark chocolate chips, raisins, coconut flakes. 17. Movie Night: Popcorn, peanuts, M&Ms, dried cranberries. Pro tip: Use hot popcorn to melty the chocolate. 18. Cereal Lover: Bran flakes, shredded wheat cereal, puffed rice, granola, cashews, dried cherries, dried cranberries, dried blueberries. 19. Deconstructed Puppy Chow: Almonds, whole-grain Chex or wheat cereal, dark chocolate chips, peanut butter chips, cacao nibs, dried cranberries. 20. PB&J: Peanuts, dried strawberries, peanut butter chips, shredded wheat cereal. 21. Cajun Blend: Almonds, pecans, walnuts, sunflower seeds, pumpkin seeds, sea salt, garlic powder, chili powder, ground cumin, cayenne pepper.